Just feed the pouch in the machine & release. Machine bands catch hold onto the pouch, quickly seal it & move it ahead. 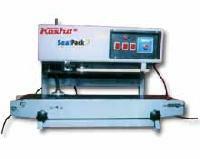 If you have large number of Pouches, bags, small packets, which need to be sealed speedily - then this is the machine you are looking for. Just keep feeding the filled pouches from one side of the machine. The Roller Bands will heat seal your pouch, move them forward & release them at the other end. No operator handling is required - thus making the sealing process very easy & fast. It is used to fill Tea/ Coffee bags, snacks, powders, pharmaceuticals, chemicals, seeds, spices - any type of bags / pouches in large volume & need to be sealed fast. 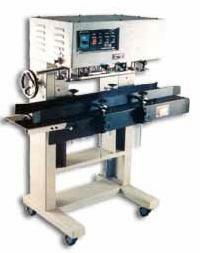 CONTINUOUS POUCH SEALING MACHINE - Heavy Duty Model - In C.I. and Stainless Steel (SS). Fast sealing of any type of pouches / sachets. Just feed in the packs in the m/c bands and release. All types of heat sealable materials incl. PP, PE, LD, LLDP, HM, HMHD, Aluminum Foil laminated pouches, polyester film bags - all these can be easily sealed in continuous process.